Before this timed tour even got underway, there were omens that the 2017 Denver-Aspen Classic was going to be epic. When I took the Litespeed out for a final, gear check ride the night before, I didn’t even make it a half-mile out of the neighborhood before water resumed falling from the clouds. 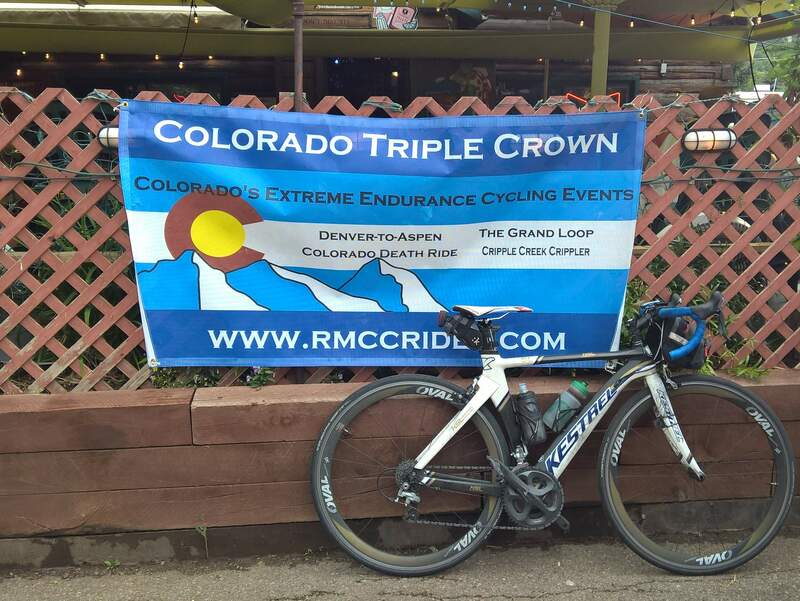 I turned around, satisfied that the bike was in working order, and muttered something to myself about how I’d rather it be pouring now than during the final event of the Colorado Triple Crown series. As it was, during the last 15 miles of the Way Too Early drive down to the ride start in west Denver. water droplets from the sky were landing on the windshield with a frequency five times more pronounced than a drizzle. I figured it would end soon—this is Colorado, after all, home of “if you don’t like the weather, wait 10 minutes”—so I remained huddled in my car for a quarter-hour across the street from Sloan’s Lake Park. Finally, after 20 minutes, I stepped out of the vehicle to walk 100 feet in the rain to the check-in area. It didn’t look like the stormclouds were going to clear anytime soon. I asked Mark Lowe—the mastermind of the Colorado Triple Crown series and a tremendously strong cyclist—how it was going. “Well, I’m a little nervous, for myself and for the group,” he confessed with great candor. I looked around the parking lot and the mood of the other cyclists seemed as sullen as the skies. His words would ring true throughout the day. Lookout Mountain (Category 2) from Golden. We descended this during the final bit of the Tim Kalisch Memorial Grand Loop a few weeks ago, so this was a nice pick up from where we left off. Loveland Pass (Hors Catégorie starting from Georgetown). This peaked at 11,990 feet. Swan Mountain Road (Category 4). This was the easiest climb of the tour, and I did not even remember it on the way to Fremont Pass. It must have been gradual. Fremont Pass (Category 1, from Copper Mountain). The summit was at 11,318 feet. Independence Pass (Hors Catégorie). Its elevation was 12,095 feet. My body felt decently robust on Lookout Mountain and Loveland Pass, even if I ultimately got gapped on Lookout Mountain by the speedsters and was riding virtually alone ahead of only a few folks on the way to Loveland Pass. Considering the conditions and climbs, I was intent on staying within my limits, even if I had briefly pondered trying to ride a bit harder this time than the two other double centuries during the year when I felt like I was rarely giving anything beyond 60% effort. A few miles past Loveland Basin, I did exclaim to the birds, “man, there’s too much climbing”—but I was feeling far from horrible. I also had to brake virtually the whole way down the descent beyond Loveland Pass due to the rain and switchbacks, meaning that I was hardly making up any time that I lost by riding skyward. 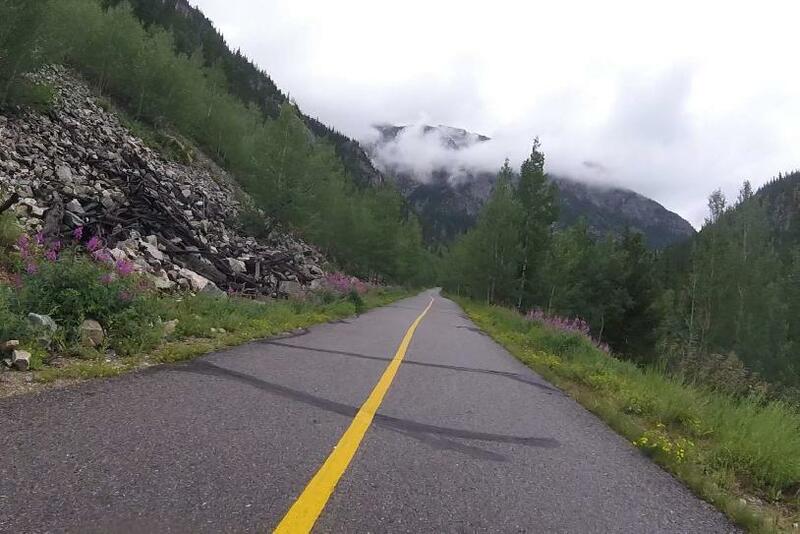 The bike path through Summit County was tranquil, and it reminded me of how it captivated my imagination the only other time I rode it, during the Great American Western Road Trip in 2005, before I decided to move to Colorado. Never mind that this time, I unwittingly got off-course and—in addition to having to backtrack once—I found myself on a road under construction near Frisco that was not only dangerous, but seemingly not the correct way. I pulled off the road to check the RideWithGPS app, and then a helpful construction worker came over to assist me over a concrete barrier and pointed out the bike trail I was supposed to be riding on. From that point on, it was fun riding, away from cars and scarce pedestrian traffic. I ascended Fremont Pass without any more drama and then there was just one more monster pass left: Independence Pass. I was eager to get it over with so at Twin Lakes checkpoint at Mile 136, I stopped for only two minutes to guzzle a couple Cokes (I chugged five 12-ounce cans total that day) before setting off. One thing I have gotten pretty good at during double centuries this year was not looking at how many miles or hours I had ridden. With these ultra-long climbs, it could be easy, I imagine, to psych yourself out with details on how much farther you need to go. In my case, I kept that info out of mind. Best to assume there’s still an hour, two hours, or more to the top and just keep on churning the pedals. 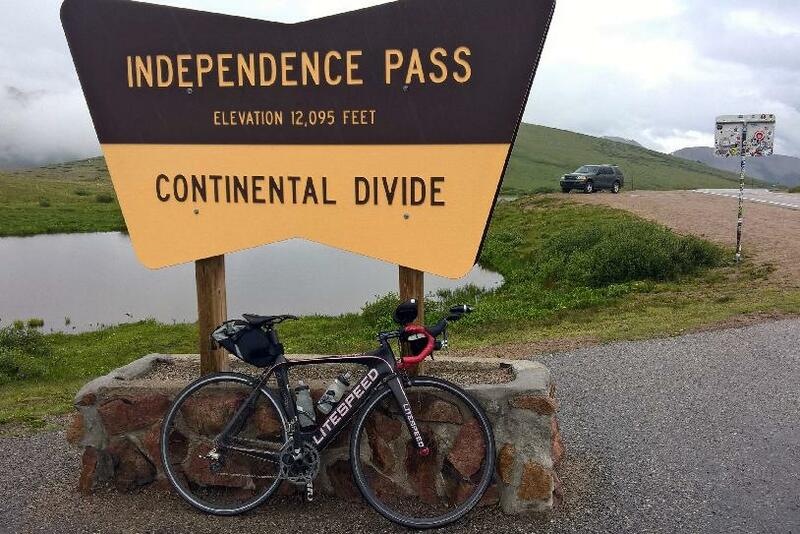 At some point, however, Independence Pass did feel interminable. I could see long switchbacks above ultimately heading towards a break in the mountains, but once I rounded the mountain I was on, there were more long switchbacks. I felt slow and fatigued and was dealing with another odd problem: water was going straight through me. Aside from the 30-mile stretch between Checkpoints 1 & 2 when I drank nearly two entire water bottles, I had not been drinking much all day. Yet, I had to pull over and water trees five or six times. I would joke that the thirsty plants were loving it, except they were already drowning in fluids from the sky already. Finally, I reached the top, and I stopped briefly for a photo. A tourist asked me if the road I had ridden was as narrow as the one he had just driven and that I was about to head down. I could not say as this was my first time in this neck of the woods, but I could see exactly what he meant by “narrow” as I navigated down the switchbacks on a road that was barely wide enough for two cars. It was 28 miles and all downhill to Aspen, yet this turned out to be one of the most daunting stretches of the ride. First, it was raining hard. Second, it was cold—about 40 degrees or maybe even less. My feet and hands were going numb, which was not a great feeling when I had to be braking most of the way. (Grabbing a fistful of the right brake lever, incidentally, did very little to slow me down when the roads were so wet. It made me think that the road bike disc brake advocates might be onto something.) Third, there was quite a bit of car traffic. I pulled off the road a couple times to let the cars go by. I also encountered a cycle tourist with fully laden panniers, and he was descending even slower than I was. I have already alluded to the climate several times, but the rain added so much to the day’s saga that it warrants its own section. The temperatures at the start were actually fairly warm (mid-60s Fahrenheit), so I started the ride without a rain jacket—especially since I knew we would be climbing Lookout Mountain after only 11 miles. The early morning stretch was quite lovely, with a gorgeous sunrise resplendent in its pink and scarlet colors. Good thing he was not in the weather forecasting business. Not only did it rain almost the whole way up to Loveland Pass, but the storm intensified on the way down! I saw the same friendly guy at the Mile 102 checkpoint (the top of Fremont Pass). He then told me, “at least the worst of the weather is over.” Of course, not long after that, it started raining again. I was started to think not only was he not a good meteorologist, but he was downright jinxing the weather with his musings. By this point, not only were other cyclists expressing dismay about the inclement conditions (several abandoned after Loveland Pass), but my own bike was complaining by making horrible noises with the chain. Squeak, squeak, squeak. I had freshly waxed the chain before the ride, but it was no match for Mother Nature and her power jets. The weather reached a climax after I summitted Independence Pass, getting so dismal that I wondered whether I was going to have to stop somewhere on the downhill to take cover. The sun finally came out for the first time all day when I rolled into Aspen, only six miles from the finish at a tavern in Woody Creek. I made the following video of the Denver-Aspen Classic. You can see how the course and climbs were like without having to pedal your bike for 15 hours. 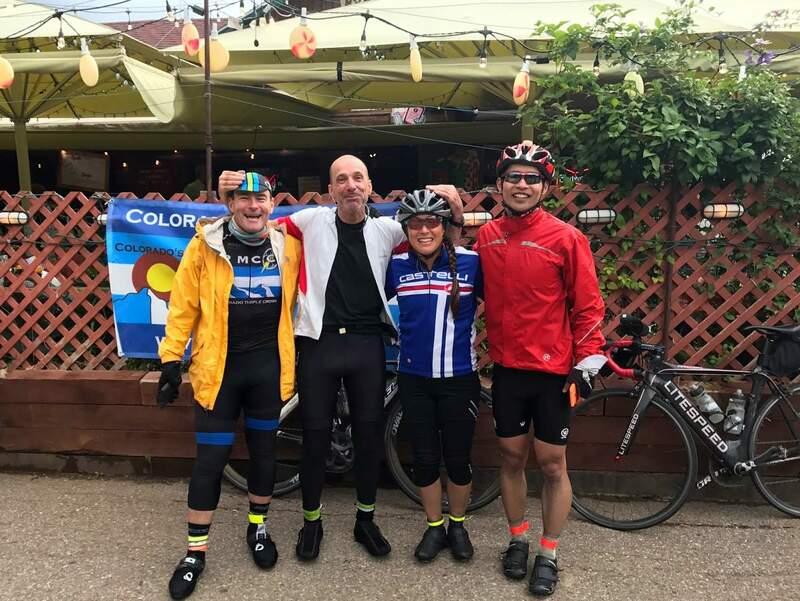 Months ago, when pondering doing this ride, I had considered biking back to Denver the day after to make it a 362-mile weekend. I nixed that plan after riding the Tim Kalisch Grand Loop. I am especially glad I did not do this after experiencing the weather this weekend. Instead, I reserved a rental car at the Aspen Airport. This meant having to backtrack from Woody Creek six miles, but since I finished the ride at 7:00 p.m. I had a couple hours to do so before Avis closed at 9:00 p.m. for the night. 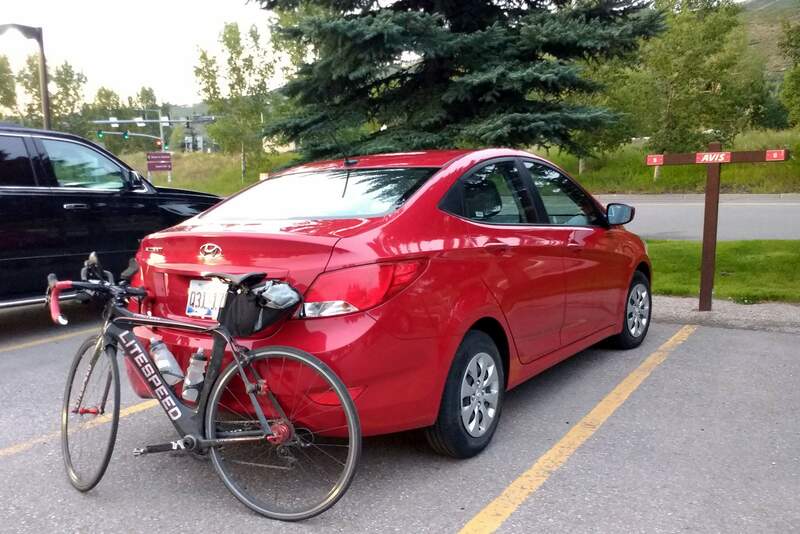 I then started to drive the Hyundai Accent rental sedan, but was sleepy enough that I decided it would be best to stay somewhere for the night. 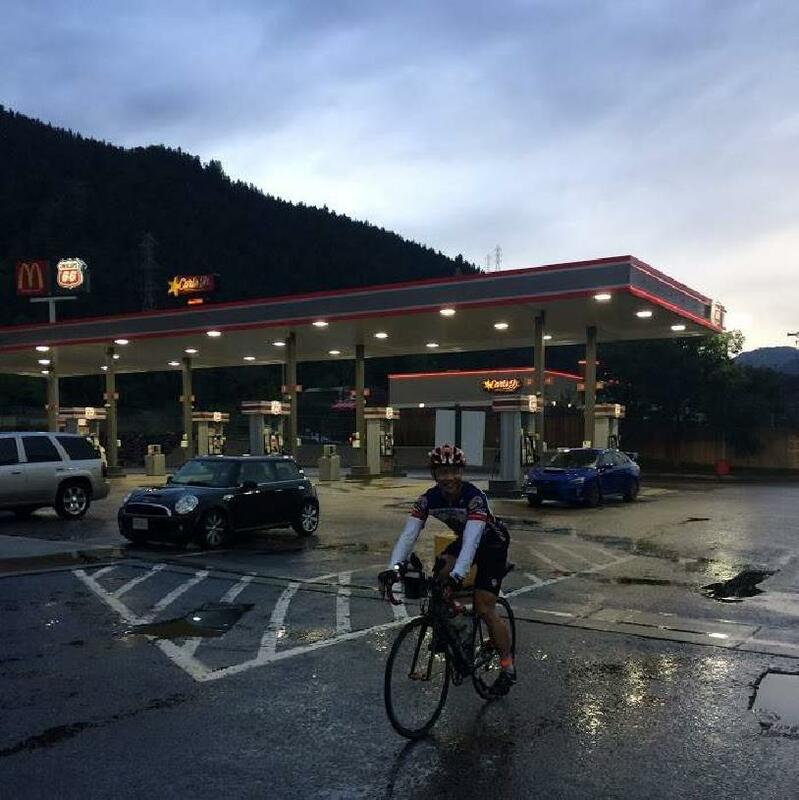 Amazingly, there were no vacancies at any hotel around Aspen or Glenwood Springs, and I ended up sleeping in the rental car at a rest stop off I-70 for six hours. I made it back to Denver to drop off the rental car shortly after Avis opened in the morning. 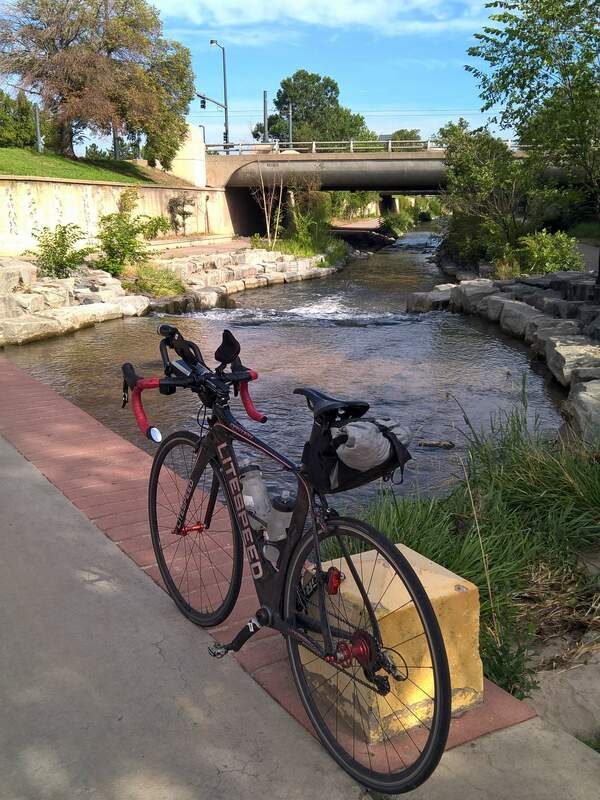 Then I biked four miles from downtown Denver to my PT Cruiser, getting to explore Denver a bit by bicycle. Its cycling infrastructure seemed good, although one pain point was that the traffic lights seemed to operate on timers instead of sensors. Consequently, practically every block there was a red light even when there was no traffic along any of the intersecting roads. I could imagine people in, say, Vietnam—where traffic lights are mere “suggestions”—thinking that we Americans have a very inefficient traffic system. My squeaking bike not only sounded horrible, but the friction was probably worth a loss of several watts. But at least the bike trails around Cherry Creek were a delight. Time: 4:00 a.m. start; 7:00 p.m. official ride end -> 15.0 hours (12.5 MPH average). Backtracking to Aspen took another 25 minutes. 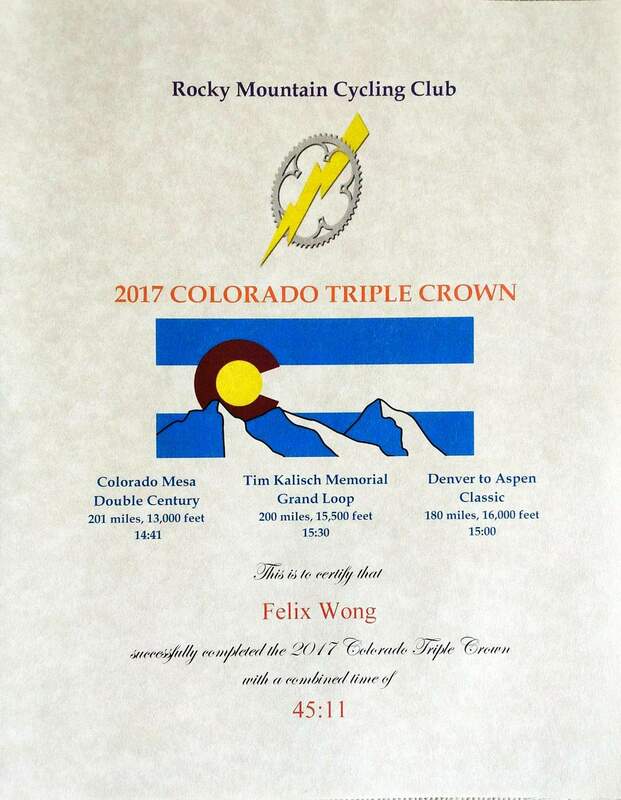 With this ride, I completed the Colorado Triple Crown, which was modeled after the California Triple Crown—the same series I was riding between 1996-2005! It entails riding three official double centuries in a year.